The weather Friday morning was quite nice: mostly clear skies, gentle wind, happy sun. The problem was what came later. NOAA are really the only guys I’ll trust to accurate predict the weather, and they were saying things were going to be great until about 4pm, then a wall would descend. There’d be light rain and lowering cloud levels, generally making a cross-country VFR flight something of a dodgy experience. And of course with work and Xander’s piano lesson, it was unlikely we’d get wheels up any time before about 4:30pm. Still, the more I studied the forecasts Friday morning, the more confident I was that while things didn’t look great, they were going to stay good enough for a safe flight. I blitzed through as much work as I could, then I departed for the airport around 3:30pm to get the airplane loaded and prepared for departure. As I was finishing the last of the preflight checks and topping off the fuel tank, the light showers started. There was a wall of darkness to the south, but fortunately we were going north. Like a paranoid crazy person, I kept checking the weather and forecasts, and it all kept saying the same thing: It’s going to be ugly, but it’ll be safe enough the whole way. Turns out, those guys at NOAA know a thing or two about accurate weather reporting. We didn’t get wheels up until almost 5pm. Sundown was to be at 6pm. That’s enough time to get up to our destination, but the clouds kept thickening up. As we flew northward, our visibility stayed pretty close to 10 nautical miles. 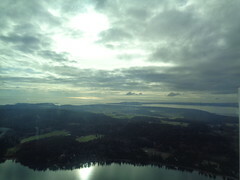 However, due to the cloud ceilings at about 3,000′ or so, I flew the whole trip at 1,500′. We made great time; a tailwind helped. 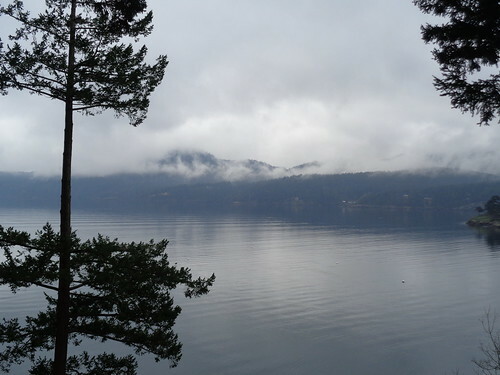 But by the time we got up to Orcas Island, the thickness of the clouds combined with the lateness of the hour made the waters around Rosario Resort a bit too dark for my comfort level. We could clearly see the Resort, its marina, and the whole area quite well, but it was just dark enough that my paranoia got the best of me. I decided to fly on a few more minutes up to Eastsound (the town) and land at its airport, since it was a lighted surface and reasonable well-known to me. We called up a taxi, and in what seemed like no time at all were at the Resort. The view from our window (or rather the deck that extended from our window) was fantastic. 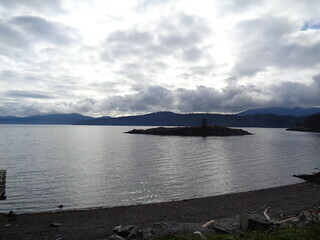 It overlooked the southern half of Eastsound (the sound). The resort itself is gorgeous. 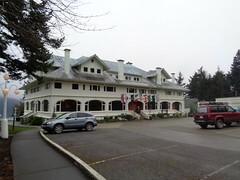 The food at the mansion is extremely good; I’ve only ever had better at the Rainier Club. The staff everywhere were wonderful, extremely professional. 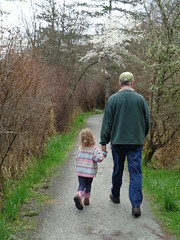 After a leisurely Saturday morning breakfast, we strolled back to our lodging, enjoying the man-made parks and God-made beaches and forests. 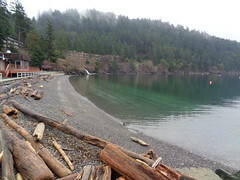 We hopped a taxi back to Eastsound and loaded our bags back into the airplane, but the weather hadn’t improved enough from the night’s nastiness for what I felt was a safe departure, so this gave us an opportunity to wander around Eastsound (the town) for a while. We ate lunch at a restaurant overlooking the north end of the sound, and we got to watch the weather improve while eating some wonderful food. Following lunch, we wandered across the street into an ice cream shop where everyone except me (because I ate all my lunch and was therefore full) ordered and consumed mint chocolate chip ice cream. 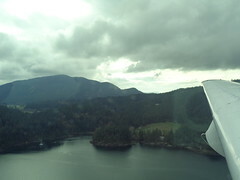 We then headed back to the airport, loaded up, and got ourselves back up in the air for the flight south to home. I don’t like using the phase “being blessed” when it comes to the opportunities I can provide my family because we’re fortunate to live in the country we do and because I work as hard as I do to wrench prosperity from those opportunities. I don’t like the phrase because it feels to me like it’s harboring an unspoken implication that we’re superior to the norm, that God is favoring us over others, or that God cares about economics, and that just doesn’t align with my theology. Still, after a weekend such as this, I feel I’ve had privileged opportunities. Skimming along through the air, cruising a third of a mile above the water and an FAA-approved spacing below the clouds, soaking in the Majesty reflected off Nature, one can leave behind the worries of the week, if only for a weekend.